Like most people, I wait with eager anticipation for the postman to deliver the mail each day and, each day, I find that, if it isn’t bills he’s put through the letter box, it’s circulars that go straight into the recycling bin. So when a card sized envelope arrived with a nicer quality about it than most – and especially as it wasn’t my birthday – I was intrigued. Why do we always feel envelopes and squint at postmarks to try and work out what is inside when all we have to do is open them and take a look? How extraordinary! Why me? 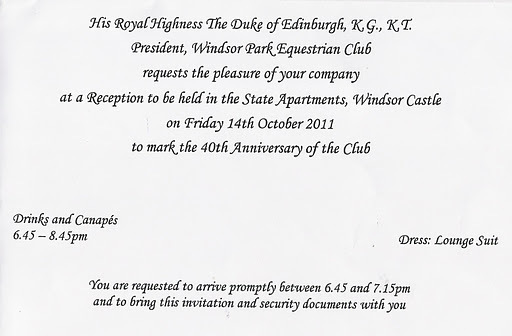 Why should I be drinking and eating one evening soon with Royalty? The answer was, of course, it wasn’t me at all, it was my partner who has spent a lifetime working with and competing horses. Horses have always been close to the Royal Family and both the Queen and the Duke of Edinburgh are knowledgable and skilled horsemen. Carriage driving at top competition level had, until recently, been a regular part of the Duke’s regime and we had often been to watch him race at Windsor Great Park. We too, have also participated in driving although my competition level is still at the most basic. My partner is much more skilled and fearless and I always marvel when a neurotic and potentially lethal animal becomes calm and pliable under his control. 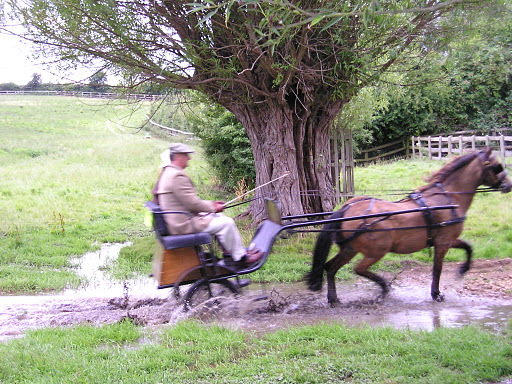 The photo below is of us just out for a quiet afternoons drive – although the pony did have his moment a little later when we careered out of control amongst the trees. Thomas could become quite exciteable at times! I realised with dismay that the date on the invitation was the day that we would be on Exmoor for a couple of weeks holiday, 150 miles away. Working on the theory that we’d never likely receive another invitation we postponed the trip by a day. And so, that early evening we drove up to the closed gates of Windsor Castle, showed our credentials and passed through to be further security checked. Once this had taken place we were driven by an offical to the Quadrangle and the State Entrance. Thie entrance, as it’s name implies, is used on State occcasions and the Quadrangle is used for military parades, including the regular Changing of the Guard. 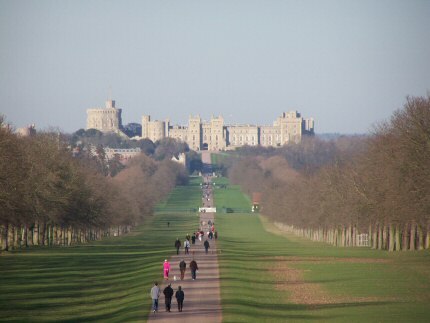 From here is a panoramic view of the castle buildings, the oldest of which date from the 11th century (making Windsor the world’s oldest inhabited castle), and the Long Walk: a tree lined vista that cuts across the Great Park for a distance of over two and a half miles. We entered the building by the Grand Staircase, with it’s fine displays of armour and firearms. Here we were able to see the musket ball that killed Lord Nelson which had been presented to Queen Victoria. Queen Charlotte’s sedan chairs were also here, remarkably small, I thought. The reception was held in St George’s Hall, which was at the centre of the fire in the 1990’s and completely destroyed. As a consequence, the restoration work has made the green oak, hammer beam roof the largest to be constructed in that century. The craftsmanship and colours are extraordinary: set into the roof are the shields of every Knight of the Garter with some shields being blank. These, I discovered, were not reserved for future knights but were of those that had fallen from Royal favour. Nothing prepares you for the sheer magnificence and size of this room as you enter – it measures 185 x 30 feet. Here we met other guests – there were only about two hundred – and, finally, the Duke who arrived with little pomp or ceremony. The Duke made a short speech before joining us informally to champagne and canapes. I was impressed not just by his energy (he is now over 90) but also by his wit. He really is very funny, indeed. I wondered how many other people of his age could carry out all these duties day in, day out and still make you feel as if you were of interest to them. Both he and the Queen – who works equally hard – may live in splendour with aides and courtiers but I wouldn’t exchange places with them: I will be more than content just to still be able to hear, see, think and garden! Access was also granted to The Grand Reception Room and The Waterloo Chamber, where the immense and seamless, two ton carpet took fifty soldiers to lift to a place of safety during the fire. What I found surprising was that we were given free access to wander around these rooms at will, although I’m certain that if we had attempted to go elsewhere we would have found our way blocked! Sadly, because we were attending a royal event, we were not allowed to take photgraphs, so I am unable to show you the splendours of these rooms. You will find them, however, if you look in a search engine. The evening came to a close after two and a half hours and, as we stepped back out into the autumn air in the Quadrangle, I was struck by the realisation why it is traditional to say, upon the death of a monarch, “The King is dead, long live the King”: for all the affection that the current Queen has in the hearts of many of her subjects, the Office is greater than the individual. The institution of monarchy has worked well for this country, long may it remain so. This entry was posted in carriage driving, Exmoor, horses, Queen Victoria, Royal Family, Windsor Castle by johnshortlandwriter. Bookmark the permalink. What wonderful reading! Thank you for sharing your visit! And lucky, lucky you. thrilling! was the food good as well? What a great thing to remember. How splendid you wrote of this visit to Windsor Castle, and how fantastic, you shared it. I can feel in your words how thrilling an experience it was and your invite was so deserving. (loved the photo of you both on the carriage) I've been to the castle you know…that was memorable enough visiting as a tourist but to be a guest…well, that tops it all. Again, just a pleasure to read. Johnson, what a remarkably extraordinary experience for you and your partner, and that about which you will talk many days to come. Fond memories. Thank you. What fun! Congratulations on your once-in-a-lifetime audience with the Prince. How wonderful. I'm so pleased you enjoyed it.